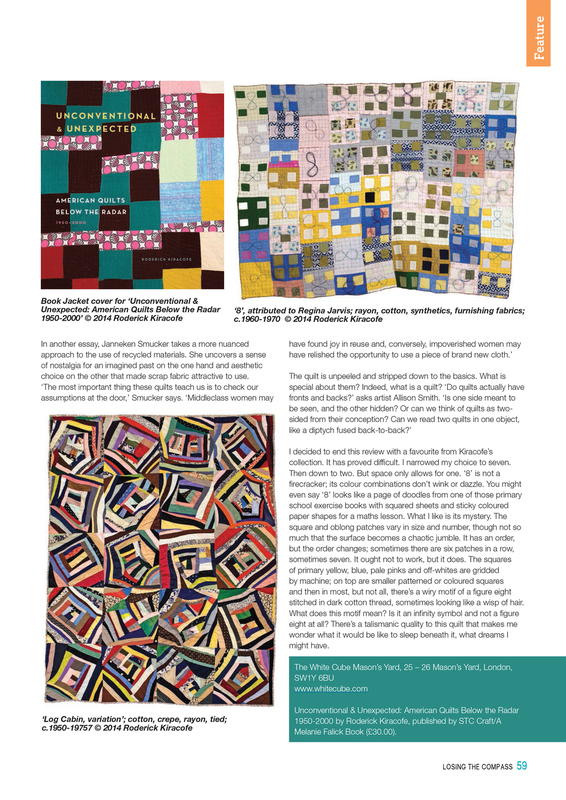 I am thrilled that Deborah Nash of British Patchwork & Quilting writes about my publication, Unconventional & Unexpected, alongside the exhibition Losing the Compass. Ms. Nash picks up on many of the beautiful motifs I love about both quilts and the pieces in the exhibition at White Cube, noticing the relationships between accident and chaos with structure. She sees the distortions in the Boetti embroidered pieces amidst the stringent grid; she sees the "wobble" of the quilts' edges in Unconventional & Unexpected. Here are artists and quiltmakers willing to see what happens when you venture outside the grid. Personality happens. All the while Ms. Nash recognizes the need for context and conversations around all of these pieces and how publications and exhibitions can act as a bridge between the fine art and the textile/craft communities. She speaks about the artworks and the quilts in the same language. Featured are images from the exhibition, as well as quilts from my collection. I am pleased that she chose to feature the brilliantly orange Nine Patch, Virgie Walton's Stripes, Original Design of work clothes, 8 which is included above, and a Log Cabin, variation. A huge thank you to Ms. Nash and everyone across the pond at British Patchwork & Quilting! Read "Losing the Compass: Unconventional and Unexpected" in the March 2016 issue of British Patchwork & Quilting.